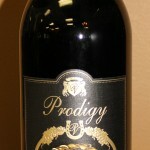 Tasting Notes: Dry, medium- bodied with tones of blackberries and cherries wrapped in an herbal bouquet. A nuance of licorice, tobacco and oak on the finished. Barrel aged 9 months.